While Aboriginal children represented 7% of all children in Canada in 2011, they accounted for almost half (48%) of all foster children in the country. Among Aboriginal foster children, 44% lived with at least one Aboriginal foster parent. These findings are included in a new study, "Living arrangements of Aboriginal children aged 14 and under." The study also includes more detailed information about the living arrangements of First Nations, Inuit and Métis children. In 2011, there were nearly 400,000 Aboriginal children aged 14 and under living in diverse arrangements across Canada. Aboriginal children were more likely than non-Aboriginal children to live with a lone parent, with their grandparents or in a stepfamily. They were also more likely to live in larger families. In 2011, the most common type of living arrangement for Aboriginal children was a family with two parents. Half of Aboriginal children lived with both parents, compared with 76% of non-Aboriginal children. More than one-third (34%) of Aboriginal children aged 14 and under were living with a lone parent, twice the percentage of non-Aboriginal children (17%). 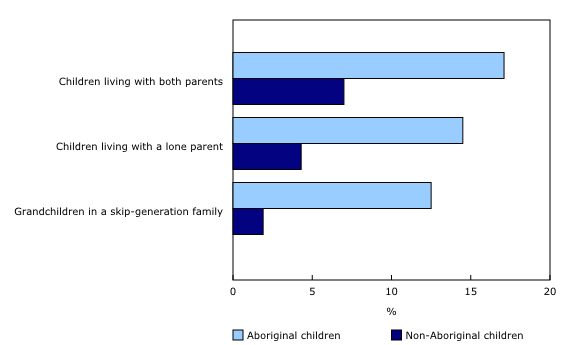 Among very young Aboriginal children (under the age of one), 36% were living with a lone parent. This compared with 10% among non-Aboriginal children of the same age. Aboriginal children were more likely than non-Aboriginal children to live with their grandparents, in a stepfamily or in other types of living arrangements. In 2011, about 13% of Aboriginal children lived with at least one grandparent. Most of these children were living with at least one grandparent and at least one parent. Less than 3% of all Aboriginal children, however, were living with at least one grandparent but without their parents (skip-generation). By comparison, less than 8% of non-Aboriginal children lived in a household with a least one grandparent and 0.4% were in a skip-generation household. In 2011, about 17% of Aboriginal children aged 14 and under lived in a family with four or more children in the same age group. This compared with 7% of non-Aboriginal children. In all types of families, Aboriginal children were more likely than non-Aboriginal children to live in a large family. For instance, 15% of Aboriginal children living with a lone parent lived in a family with four or more children, compared with 4% of non-Aboriginal children in the same situation. Similarly, 13% of Aboriginal children in skip-generation families lived in a family with four or more children, compared with 2% of non-Aboriginal children in the same situation. In 2011, about 14,200 Aboriginal children were foster children. Aboriginal children accounted for nearly half (48%) of all children in foster care, even though they accounted for 7% of the overall child population. These proportions varied across the country. In Saskatchewan and Manitoba, for example, where Aboriginal children account for more than a quarter of the total child population, they represented 85% or more of those in foster care. In Nunavut, the Northwest Territories and Yukon, where Aboriginal children represent a larger proportion of all children, almost all foster children were Aboriginal. Of the 14,200 Aboriginal foster children, 82% were First Nations, about 13% were Métis and 4% were Inuit. The rest (1%) reported multiple Aboriginal identities or other identities. The Aboriginal identity of potential foster parents is often considered an important factor in the placement of Aboriginal foster children. Of the 14,200 Aboriginal children in foster care in Canada, 44% lived with at least one foster parent who had an Aboriginal identity. 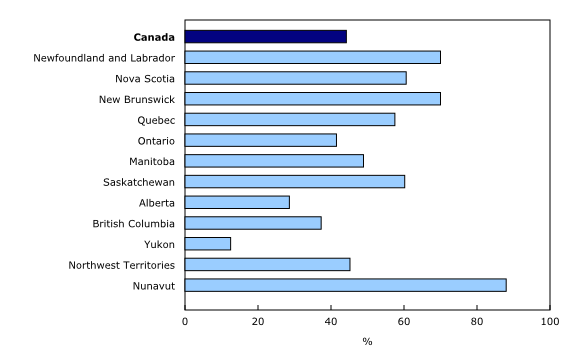 The percentage varied, however, across the provinces and territories. In all provinces located east of Ontario, the proportions of Aboriginal foster children living with at least one Aboriginal foster parent were higher than the national average, ranging from 58% in Quebec to 70% in New Brunswick and Newfoundland and Labrador. In Ontario, the percentage was lower, at 42%. In western provinces, Saskatchewan had the highest proportion (60%) of Aboriginal foster children living with at least one Aboriginal foster parent, while Alberta had the lowest (29%). In the territories, the percentages were 13% in Yukon, 45% in the Northwest Territories and 88% in Nunavut. This article is based on data from the 2011 National Household Survey (NHS) and focuses on children aged 14 and under living in a private household. The Aboriginal identity concept was used in all analyses. Aboriginal identity refers to whether the person reported being an Aboriginal person—First Nations (North American Indian), Métis or Inuk (Inuit)—and/or being a Registered or Treaty Indian (registered under the Indian Act of Canada) and/or being a member of a First Nation or Indian band. Single and multiple responses to the Aboriginal identity question are possible. Foster children are defined as children in private households who were reported as foster children on the NHS questionnaire. Foster children are considered as "other relatives" outside of a census family. Because the direct relationship between the adults in the household and the foster children is unknown, the adults chosen are the reference person and spouse of the reference person in the same economic family as the foster child or children. The article, "Living arrangements of Aboriginal children aged 14 and under," is now available in Insights on Canadian Society (Catalogue number75-006-X), from the Browse by key resource module of our website, under Publications.